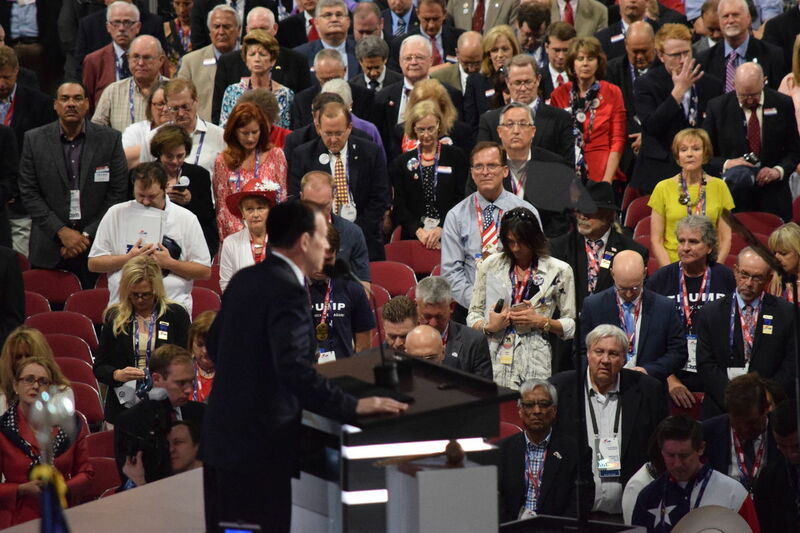 At the 2016 Republican National Convention, held in Cleveland, a rabbi from Cleveland give the invocation. Watching this with pride I remembered that there was an earlier time when another Cleveland rabbi did that. Thus, as food for thought, and without comment, I present the two invocations side by side. General Dwight Eisenhower was nominated. Senator Richard Nixon was selected as his running-mate. Rabbi Abba Hillel Silver (Reform), of The Temple - Tifereth Israel, delivered the invocation. Father of nations, the generations of men come and go before Thee. Unto each dost Thou assign its special task and mission. In Thine unfathomable plan Thou hast summoned this nation to world leadership in an age dark with confusion, beset with dangers and yet alive and tense with the stirrings of great new beginnings. Make us worthy and willing instruments of Thy divine purposes. Use us for the healing of the nations, oh Thou ruler of all nations. Use us for justice, for freedom, for unity and for peace. Help us to move resolutely and unafraid into the searching days which lie ahead, relying upon Thee, and upon the unseen power behind all visible might and drawing our inspiration from our own prophetic task, from the imperishable movements in our history when we were tried as a people, tested in crisis and battle and were not found wanting. Guide us into a glad acceptance of our growing responsibilities as we assume leadership in the fellowship of the nations of the world, accepting no permanent divisions among them and giving no credence to any irrepressible conflicts. Bless the United Nations, and all those who seek peace and pursue it. Gird us with the faith which will inspire us to seek opportunities for unity with other peoples in the building of the good society. the gracious commonwealth of humanity when each man shall dwell under his vine and under his fig tree and none shall make him afraid. Source: Jewish Independent, Friday July 11, 1952, Cleveland Jewish News online archives. Donald Trump was nominated. Governor Mark Pence was selected as his running-mate. Rabbi Ari Wolf (Orthodox), an administrator at the Telshe Yeshiva, delivered the invocation. Please join me as we pray for God's blessings for the success of our mission. ovenu shebashomayim; Our Heavenly father, we acknowledge your grace and your beneficence. We ask for your blessing upon this Republican National Convention and all those gathered here; we ask for your blessing of our country and our people; and we seek your guidance and continued protection. Lord God, we live in perilous and dangerous times. Today, our beloved country is under attack: our family values, our moral principles, and even our very democracy is threatened. We beseech you for your continued watchfulness and protections as we renew our covenant of faith with you and with each other. Lord, protect our leaders, protect the members of our armed forces, who serve so valiantly. Bring them home when their noble missions are done. Lord God, watch over and safeguard our police officers and all our first responders who work each day and night in every city, town and hamlet of our great nation to protect us and our freedoms. We ask this of you Oh Lord, not because we have merit, but because we rely upon you and your merciful Grace. Lord, please bless all those engaged in this Convention, and that thy will be done in their deliberations. May God bless you and keep you; may God shine his countenance upon you and be gracious to you; may God lift up his face to you, and give you peace in a world of peace, and let us say amen. Source: text provided by Rabbi Wolf. Shows Rabbi Wolf and the faces of many at the convention listening to his prayer.